We are very familiar with speed bumps and rumble strips. They are common now and are on every highway and interstate. I remember the first place I ever experienced them. On Route 22 in Easton, PA there is a very sharp curve, called “Cemetery Curve” – appropriately named in light of the many deadly accidents, though actually named because of the nearby, historic cemetery. Over time, the many warning signs leading up to the curve proved to be insufficient. Finally, rumble strips were used, and I remember the first time going over them and the startling sensation that made you slow down and pay attention. The strips were there as a preparation for what was to come – to educate you that there was an appropriate way to negotiate that turn. Likewise, the Old Testament was full of signs and information that a coming Messiah would be on the scene. A part of that would be someone who, in the spirit of Elijah, would prepare the way for the coming of Israel’s king. This person was the cousin of Jesus – John the Baptist. What is repentance? By definition, it means to agree with God about the nature of sin (to see it from the same perspective He sees it), along with a commitment to walk in the opposite direction (which is the proof, or fruit of a genuine repentance). You surely know of the most famous Peanuts comic strip – the one with Lucy and Charlie Brown practicing football. Lucy would hold the ball for Charlie’s placekicking. But every time Lucy had ever held the ball for Charlie, he would approach and attempt to kick with all his might. At the precise moment of the point of no return, Lucy would pick up the ball and Charlie’s momentum would send him through the air and deposit him on his back. Now that is not really repentance. Saying you are sorry is one thing, but living a different way is another. My favorite college professor Dr. McGahey always said, “Nobody was ever saved being just sorry for their sins.” True repentance leads to change because of a new heart condition resultant from faith in the work of Christ. We choose identification all the time. Perhaps in our culture it is an identification with a sports team … a school … a club or organization. Sometimes, the things we identify with may be counter-cultural. In fact, identifying with Christ is that very thing. In a world that is going the wrong way and is under the control of the kingdom of darkness, identifying with God – with Jesus Christ – is always going to be counter-cultural. It was that way for the Jewish people before the coming of Christ. It is true where you work out in the world, or go to school. It has always been this way and always will be, until the day God makes all things new and right upon the return of Jesus Christ. Isaiah 40:1 – Comfort, comfort my people, says your God. 2 Speak tenderly to Jerusalem, and proclaim to her that her hard service has been completed, that her sin has been paid for, that she has received from the LORD’s hand double for all her sins. 3A voice of one calling: “In the desert prepare the way for the LORD; make straight in the wilderness a highway for our God. 4 Every valley shall be raised up, every mountain and hill made low; the rough ground shall become level, the rugged places a plain. Matthew 3:4 – John’s clothes were made of camel’s hair, and he had a leather belt around his waist. His food was locusts and wild honey. 3But the angel of the LORD said to Elijah the Tishbite, “Go up and meet the messengers of the king of Samaria and ask them, `Is it because there is no God in Israel that you are going off to consult Baal-Zebub, the god of Ekron?’ 4 Therefore this is what the LORD says: `You will not leave the bed you are lying on. You will certainly die! '” So Elijah went. 5 People went out to him from Jerusalem and all Judea and the whole region of the Jordan. 6 Confessing their sins, they were baptized by him in the Jordan River. MT 3:7 But when he saw many of the Pharisees and Sadducees coming to where he was baptizing, he said to them: “You brood of vipers! Who warned you to flee from the coming wrath? 8 Produce fruit in keeping with repentance. 9 And do not think you can say to yourselves, `We have Abraham as our father.’ I tell you that out of these stones God can raise up children for Abraham. 10 The ax is already at the root of the trees, and every tree that does not produce good fruit will be cut down and thrown into the fire. MT 3:15 Jesus replied, “Let it be so now; it is proper for us to do this to fulfill all righteousness.” Then John consented. We learn of the story of the coming of Christ and see that story in the bigger context of Scripture. It reminds us of the great plan of God and of the great blessing we have to be a part of that. Our inclusion is resultant from the ultimate rejection of Christ by the Jewish nation, the postponement of the earthly kingdom, and the subsequent spread of the Gospel to all peoples and nations. We also take away the timeless truths of preparation / repentance / identification. There is a tendency to not be prepared, but to rather be impressed with the wrong things – the busy things of this world. 1 Peter 1:3 – Praise be to the God and Father of our Lord Jesus Christ! In his great mercy he has given us new birth into a living hope through the resurrection of Jesus Christ from the dead, 4 and into an inheritance that can never perish, spoil or fade–kept in heaven for you, 5 who through faith are shielded by God’s power until the coming of the salvation that is ready to be revealed in the last time. 6 In this you greatly rejoice, though now for a little while you may have had to suffer grief in all kinds of trials. 7 These have come so that your faith–of greater worth than gold, which perishes even though refined by fire–may be proved genuine and may result in praise, glory and honor when Jesus Christ is revealed. 8 Though you have not seen him, you love him; and even though you do not see him now, you believe in him and are filled with an inexpressible and glorious joy, 9 for you are receiving the goal of your faith, the salvation of your souls. REPENTANCE – seeing our sin or human condition as God sees it and doing what the Scriptures say to do. IDENTIFICATION – We boldly wear our team uniform of faith, even in the context of rejection and despise. It’s okay to be weird. What does it mean to be a Christian in a changing world? Frustrated by the loss of “traditional” society, many of Christ’s followers find themselves wrestling with fear and anger. We’re not alone in this. Early Christians would often refer to the Roman society as “Babylon”—a world whose stories, whose values ran counter to the character of Christ. Peter was one of Jesus’ closest followers, and in the early days of the Church he wrote a letter of encouragement. He describes Christians as “elect exiles” (1 Peter 1:1)—strangers to the world, yet chosen by a loving God. Christians therefore greet suffering not with clenched fists, but with soft hearts, knowing that our hurt is only for “a little while,” while our hope stretches into eternity. In 1 Peter, what’s old is new again: the timeless message of the gospel offers hope for a world that presses us toward anger and despair. Let me tell you a little bit about Cappadocia, which is in modern Turkey – toward the central / eastern border. The other regions spoken of would be to the north and west of the regions within Asia Minor, which is in modern Turkey – an area beyond where Paul established the churches to whom many of the New Testament letters are written. Cappadocia is a very unique place – a place where the church flourished amongst pagan beliefs, and a place where Christians were terribly persecuted. They literally hid in cities underground, worshipping in churches carved out of the rocks. I was there in the late 90s with a group of pastors and missions leaders, as our denomination was looking to build a Christian history center in this region, with a view toward a church planting movement. 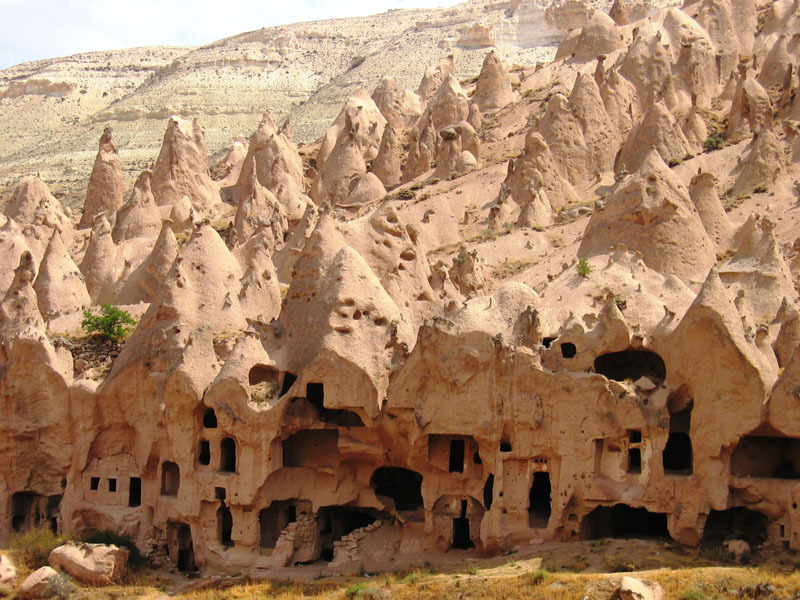 The best description I could give for what it looks like is to recall the cartoon “The Flintstones.” Cappadocia actually looks like Bedrock. People live in caves, and unique rock formations are everywhere. In underground cities, hundreds of people lived in multiple levels of a labyrinth of caves. While there, we sat in a historic cave church with art on the walls and ceilings, and we read aloud this letter. 1st Peter was written to both Jewish and Gentile converts, believers who have grown in their faith, and yet were challenged to press further in their understanding. They were challenged to truly separate from the sinful world and to pursue holiness, understanding also that suffering for their faith was a common outcome of possessing a faith originally forged in the suffering of Christ himself. Peter encouraged the Cappadocians to live like Christ in humble service, enduring the temporary sufferings of the present world for an eternal reward and crown. And that is a timeless message that is tremendously practical for our day. Our devotional series over the next seven weeks will cover the book of 1 Peter and related themes over 28 writings, both by Randy and Chris. Each week you will find them early in the morning Mondays through Thursdays. On the radio today I heard a rather new book being advertised about how the Old Testament predicted the coming of Jesus Christ! Really?!? Wow … who knew? Breaking news! Astonishing findings! I jest a bit, as actually the book is probably pretty good, though it is not from a theological scholar. Isaiah 7:14 — The virgin will conceive and give birth to a son, and will call him Immanuel. Genesis 49:10 — The scepter will not depart from Judah, nor the ruler’s staff from between his feet, until he to whom it belongs shall come and the obedience of the nations shall be his. There was great anticipation of the coming of a promised Messiah in Israel, though most people looked toward a political sort of power solution, not to a baby born to a common family in the garage of a Motel 6. Hebrews 1:1 — In the past God spoke to our ancestors through the prophets at many times and in various ways, 2 but in these last days he has spoken to us by his Son, whom he appointed heir of all things, and through whom also he made the universe. 1 Peter 1:8 — Though you have not seen him, you love him; and even though you do not see him now, you believe in him and are filled with an inexpressible and glorious joy, 9 for you are receiving the end result of your faith, the salvation of your souls. The joy was so great because the times were so dark. The promises of God were many, but the fulfillment was illusive and existed only in the faith and hope of those who believed in such assurances. Even for God’s varsity “A” team — the Old Testament prophets, they had bits and pieces but not the whole picture. It was as if they had 300 pieces of a 1,000-piece puzzle, and no box cover! The pieces were REALLY interesting. But exactly how did they go together … and when … and what did it look like … and how did the “kingly” sorts of pieces fit in with the “suffering” fragments? Feel that deep shiver of Christmas joy this year … that unspeakable joy. Ours is a strange world, hovering in some strange tension between self-improvement and authenticity. We want to “do better,” but in equal measure we want to be accepted “just the way we are.” In the church world, such a tension is felt between religious conservatives and progressives. The former long for moral improvements and seismic cultural shifts. The latter long for a place that welcomes broken people to let down their mask and be just “be real.” After all, we often insist, the church isn’t a museum for saints, it’s a hospital for sinners. Now in every real sense this statement is absolutely true. But when we use this analogy, we neglect something vital: that you go to a hospital for a specific purpose—to get better. So while the church must indeed welcome the broken and hurting, we must equally have the courage to bandage their wounds and push them toward change. Postional/definitive sanctification: When we choose to follow Christ, we are declared righteous by a holy and just Judge. This means that in God’s eyes, we are already perfect. We enjoy the same reputation and relationship as Jesus—God’s Son—and indeed we too are considered to be “adopted” as Sons of God. Progressive sanctification: But in reality we are keenly aware that our lives are far from perfect. We need to gradually allow our character to become more like God’s as we learn to lovingly obey Him. Perfect sanctification: Finally, Christians have confidence that one day we shall be entirely made holy when we are resurrected as perfect, sinless beings to occupy God’s new earth. This week we’ll talk briefly about the nature of positional or definitive sanctification—Monday we’ll look more closely at progressive sanctification. What we need to recognize, however, is that the gospel is the motivation for all forms of sanctification. Secondly, let’s notice that Peter emphasizes the fact that we set our minds not on works, not on sermon content, not on self-help projects, not on worship albums, but on the grace that came through Jesus and—more specifically—the grace that will come with Jesus’ return. This is what fundamentally separates Christianity from every other major religion and self-help program. Our faith is not primarily about what we’ve done: it’s about what God has done for us in the sending of His Son. The same God who sent His Son, who raised His Son from the dead will also equip and encourage each of His followers. This is massively different from the various self-help schemes that abound in the world—and sadly that abound even within Christendom. So if personal holiness is something you’ve been “putting off,” this may indicate that you’ve been thinking of the gospel all wrong. If you aren’t experiencing joy in your Christian journey, it may well be that you’re using your moral character as the basis for God’s approval rather than a response to God’s approval. If we change our thinking on this issue, then Christian growth becomes less about trying to “do better” but rather an expression (yes, even a behavioral expression) of hearts shaped by love for Jesus. Positional sanctification teaches that personal holiness doesn’t come “later”—it’s something you have now. The only question is, will you allow this truth to overflow your heart with joy? And will that joy be reflected in your forward progress? We have been talking throughout this series about words – cross words – and having some fun with building puzzles and crisscrossing words in various ways. You see this in our written devotionals as well as with the stage set (which you can see in a picture on the online landing page, if you are among those following this from a distance like my son Jesse in France – “Hi Jesse!”). We are able to know and understand these words and concepts from the perspective of a later time in history where we may look back at what has already happened. There yet remains a future fulfillment in the unveiling of the final completion of God’s work. We have this guarantee as a “living hope” in the resurrection of Christ – who lives and has given us through faith a new birth into an inheritance that cannot fade or be destroyed. But overall, we are blessed to possess God’s completed revelation in the Scriptures that detail for us what God has done, along with more than a few hints at what is still ahead. We actually know way more than the prophets of the Old Testament knew. These great men like Isaiah, Jeremiah, Micah, and Zechariah desperately longed to know the things that we now clearly understand. They desired clarity on the prophecies about which they themselves wrote, but they did not get it – all they knew is that what they penned would serve people at a later time. The original language (Greek) verbs for how the prophets were “… searching intently … trying to find out …” are terms that speak of an intensely thorough, turning everything upside down type of investigation to discover something. It even tells us that the angels of God “long to look into these things” – which is the translation of an original word picturing someone from the outside peering into or peeping within to get a view. The Old Testament prophets were led to write about a Messiah to come. They not only wrote, they also read what other prophets before them had written. They tried to understand it all and put it together, because it was very confusing to them. They knew the coming Messiah would suffer, but they also knew and wrote of his victory and kingdom reign. When would it be? How could this be? The best illustration that I have used over the years is a picture of the Old Testament prophet as looking toward the future, where from his perspective were two mountaintops in the same view – with a cross on the nearer shorter hill, and a crown on the larger more distant mountain. From where he stood, all he could see is both of them at the same time, seemingly in the same place. We are in the valley between, and we have God’s Word to guide our view in both directions. Today’s passage is immensely practical about what we should do with this advanced knowledge. We should live a different sort of life than the majority of others around us, recognizing we are responsible to God for what we do and how we live. This world should never really feel like home; it is a place where we serve out our time as foreigners – the ambassadors of another world. We are the purchased members of another eternal kingdom, having been redeemed by the payment of the blood of the eternal spotless lamb – Jesus Christ. Gold is mentioned twice in this passage, and silver once. We are told in hundreds of commercials to invest in these metals as a protection against the uncertainties of varied global currencies. Yet in this Scripture, gold is spoken of as a perishable thing compared to the certainty of eternal life and our inheritance in Christ. As always, the values of this world and the values of eternity totally clash. 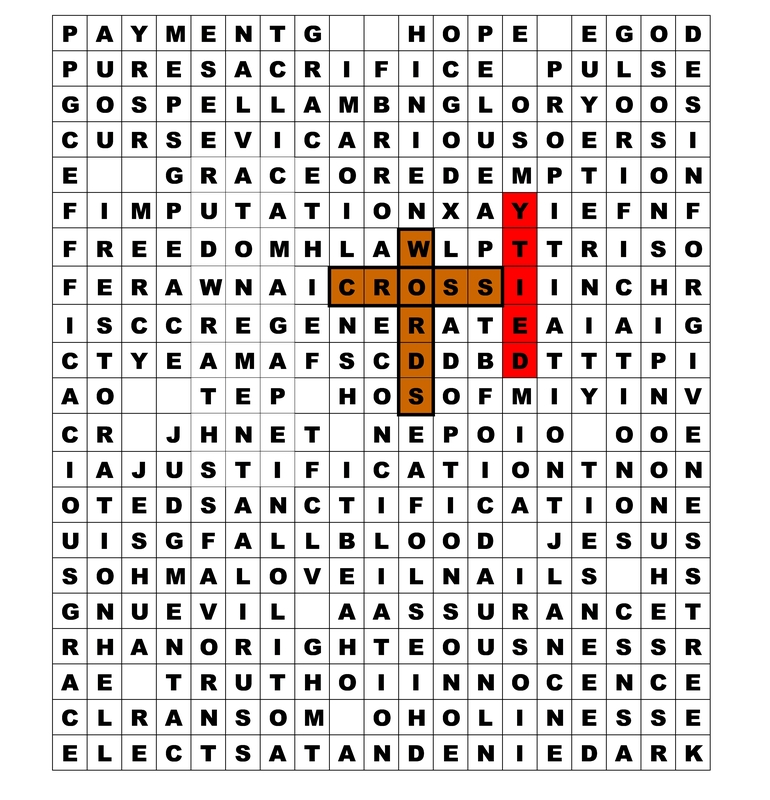 This is why it is such a value for us to know of the “cross words” that make all of the difference! 17 Since you call on a Father who judges each person’s work impartially, live out your time as foreigners here in reverent fear. 18 For you know that it was not with perishable things such as silver or gold that you were redeemed from the empty way of life handed down to you from your ancestors, 19 but with the precious blood of Christ, a lamb without blemish or defect. 20 He was chosen before the creation of the world, but was revealed in these last times for your sake. Deity – Salvation is totally a work of God. He takes the initiative and provides the perfect sacrifice … which has to, of necessity, be the divine Son of God. If Jesus is merely a good man, a great moral example, or whatever, we do not have a payment for sin and the opportunity for forgiveness and imputed righteousness.